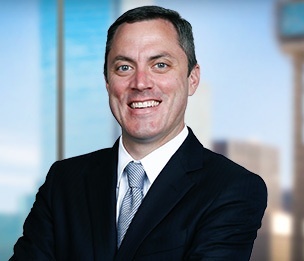 Barry McCain is a commercial litigation attorney in Dykema's Dallas office. In his practice, Barry focuses primarily on consumer financial services litigation representing various creditors and loan servicers—banks, mortgage lenders, credit cards, and auto lenders. This includes disputes over alleged violations of the Texas Property Code and home-equity provisions of the Texas Constitution. He defends against alleged violations of state and federal consumer statutes, including the Fair Debt Collection Practices Act (FDCPA), Truth in Lending Act (TILA), Real Estate Settlement Procedures Act (RESPA), and Texas Debt Collection Act (TDCA). He also litigates title disputes, lien-priority issues, and breach-of-contract claims. During law school, Barry worked as an intern at a legal publishing company and assisted with The Winning Brief and the 10th edition of Black's Law Dictionary, among other projects. Prior to practicing law, Barry worked for a national bank in its capital finance division, and also as a financial analyst. In addition, he has prior experience in the insurance industry. Nationstar Mortg. L.L.C. v. Baker, No. 4:15-cv-00455, 2015 WL 5908534, 2015 U.S. Dist. LEXIS 125388 (E.D. Tex. Sept. 18, 2015) (an application under Texas Rule of Civil Procedure 736 is a narrow procedural mechanism that cannot be removed to federal court). HSBC Bank USA N.A. v. Crum, No. 3:14-CV-3522-B, 2016 U.S. Dist. LEXIS 166499 (N.D. Tex. Dec. 2, 2016) (home-equity foreclosure limitations period is tolled during the entirety of a borrower’s bankruptcy proceeding—including the first and last days—and during the pendency of an affirmative lawsuit automatically stayed Rule 736), aff’d, 17-11206, ___ F.3d ____, 66 Bankr. Ct. Dec. 86 (5th Cir. Oct. 17, 2018). Deutsche Bank Nat’l Trust Co. v. McKnight, No. 4:15-CV-00310, 2017 WL 655657, 2017 U.S. Dist. LEXIS 23010 (S.D. Tex. Feb. 15, 2017) (unknown heirs can be served with notice of a federal suit by publication under Texas law; a foreclosure action against a deceased borrower does not violate the “probate exception” of a federal-court’s subject-matter jurisdiction). Rocha v. U.S. Bank, N.A., No. EP-16-CV-00417-DCG, 2017 U.S. Dist. LEXIS 186636 (W.D. Tex. Aug. 1, 2017) (a loan-modification that includes a balloon payment does not violate the home-equity provisions of the Texas Constitution, if it merely restructures the debt and does not provide for an advancement of new funds).